Fellow Svengoolie SvenPals will be excited about his upcoming premiere of a Columbia Pictures mystery-thriller from one of the masters of macabre cinema gimmicks. Original Columbia Pictures theatrical trailer for “Mr. Sardonicus” (1961). The beloved Chicago/Berwyn-based horror film host will present his big broadcast premiere of “Mr. Sardonicus” (1961), this Sat., April 28 at 8 p.m. Eastern/7 p.m. Central on Me-TV. “Mr. 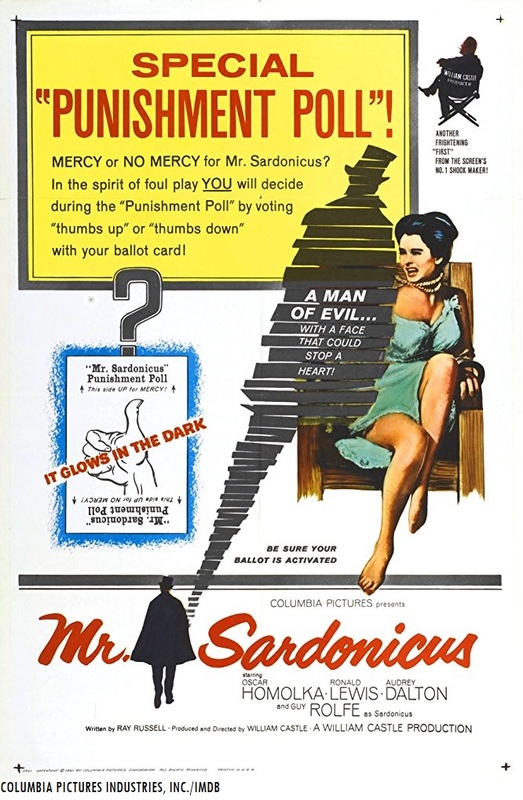 Sardonicus” was directed by veteran horror/thriller film director William Castle. This was Castle’s sixth cinematic thriller, he previously directed “Macabre” (1958, with William Prince), “House on Haunted Hill” (1959, with Vincent Price), “The Tingler” (1959, with Price), “13 Ghosts” (1960, with Charles Herbert) and “Homicidal” (1961, with Glenn Corbett). Who was in “Mr. Sardonicus” (1961)? The players who appeared in Castle’s 1961 thriller were Oscar Homolka (as Krull), Ronald Lewis (as Sir Robert Cargrave), Audrey Dalton (as Baroness Maude Sardonicus), Guy Rolfe (in the dual roles of Baron Sardonicus and Marek Toleslawski), Vladimir Sokoloff (as Henryk Toleslawski), Erika Peters (as Elenka Toleslawski) and Lorna Hanson (as Anna). 21 years before appearing in Castle’s thriller, Oscar Homolka appeared in the third Universal Studios “Invisible Man” franchise feature, “The Invisible Woman” (1940, Homolka played the role of Blackie). Eight years before “Mr. Sardonicus,” Audrey Dalton played the role of Annette Sturges in Jean Negulesco’s “Titanic” (1953). Fellow Svengoolie SvenPals everywhere will be interested in his upcoming premiere of a 1959 Columbia Pictures feature-length space farce with a familiar comedy trio. 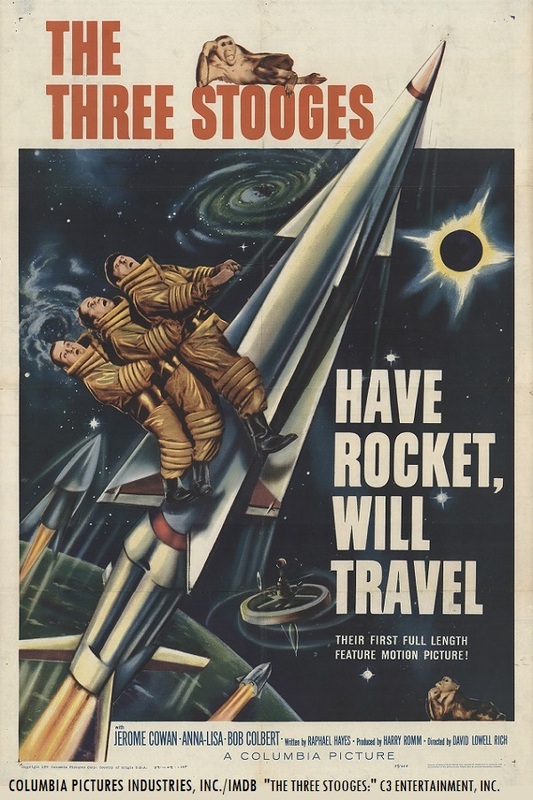 Original Columbia Pictures theatrical trailer for “Have Rocket, Will Travel” (1959, with “The Three Stooges”). The legendary Chicago/Berwyn-based sci-fi/horror film host will present his premiere of “The Three Stooges” in “Have Rocket, Will Travel” (1959), this Sat., April 21 at 8 p.m. Eastern/7 p.m. Central on Me-TV. The Three Stooges’ 1959 feature-length production was directed by David Lowell Rich. That same year, Rich also directed a musical feature at Columbia Pictures, “Hey Boy! Hey Girl!” (1959, with Louis Prima, Keely Smith and James Gregory). The players who appeared in Rich’s space-age Columbia “Stooges” comedy were Moe Howard (as Moe), Larry Fine (as Larry), “Curly” Joe DeRita (as Curly Joe), Jerome Cowan (as J.P. Morse), Anna Lisa (as Dr. Ingrid Naarveg), Robert “Bob” Colbert (as Dr. Ted Benson), Don Lamond (in his three roles as the voice of the Venusian Robot, the narrator of the film and a reporter), Marjorie Bennett (in an uncredited role as Mrs. Hermine Huntingford) and Dal McKennon (in an uncredited role as the voice of the Unicorn). Fellow Svengoolie SvenPals and aficionados of classic comedy will be excited about his upcoming presentation of a 1953 entry with Universal Studios’ legendary comedic duo! Original Universal Studios theatrical trailer for “Abbott and Costello Go to Mars” (1953). 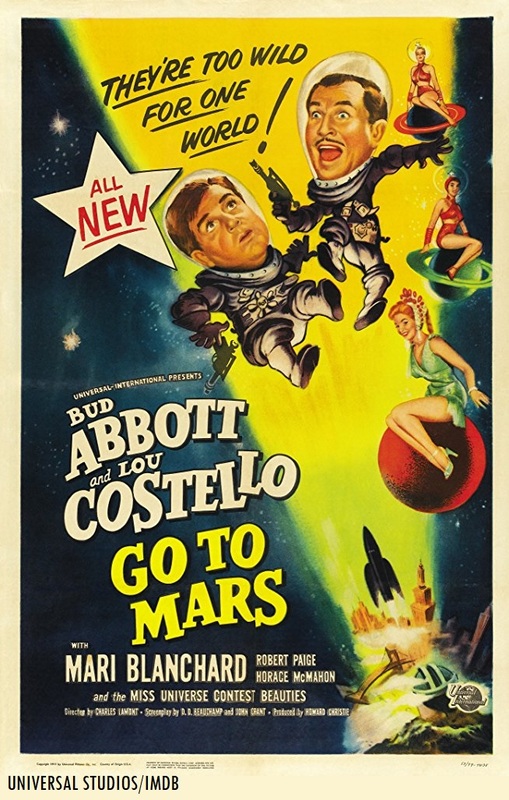 Original Universal Studios poster art for “Abbott and Costello Go to Mars” (1953). The iconic Chicago/Berwyn-based horror/sci-fi film host will showcase “(Bud) Abbott and (Lou) Costello Go to Mars” (1953), this Sat., April 14 at 8 p.m. Eastern/7 p.m. Central on Me-TV. The 1953 Abbott and Costello Universal comedy was directed by veteran director Charles Lamont. Lamont also worked on several other Abbott & Costello comedies, including “Abbott and Lou Costello Meet the Invisible Man” (1951) and the duo’s final film for Universal Studios, “Abbott and Costello Meet the Mummy” (1955). This will mark Sven’s third showing of “Abbott and Costello Go to Mars” (1953) on Me-TV. He previously aired the film back in Dec. 2012 and July 2016. The players who appeared in Lamont’s sci-fi comedy were Bud Abbott (as Lester), Lou Costello (as Orville), Mari Blanchard (as Allura), Anita Ekberg, Jackie Loughery, Judy Hatula and Jeri Miller (as Venusian Guards); Ruth Hampton, Elsa Edsman, Valerie Jackson, Renate Hoy and Jeanne Thompson (as Handmaidens); Jean Willes (as Capt. Olivia), Robert Paige (as Dr. Wilson), Jack Kruschen (as Harry), James Flavin (as the Police officer at the bank), Joe Kirk (as Dr. Orvilla), Horace McMahon (as Mugsy), Martha Hyer (as Janie Howe) and a young Harry Shearer (in an uncredited role as a young boy). Fellow coast-to-coast Svengoolie SvenPals will be excited about his upcoming big broadcast premiere of a cult fantasy-adventure creature feature. 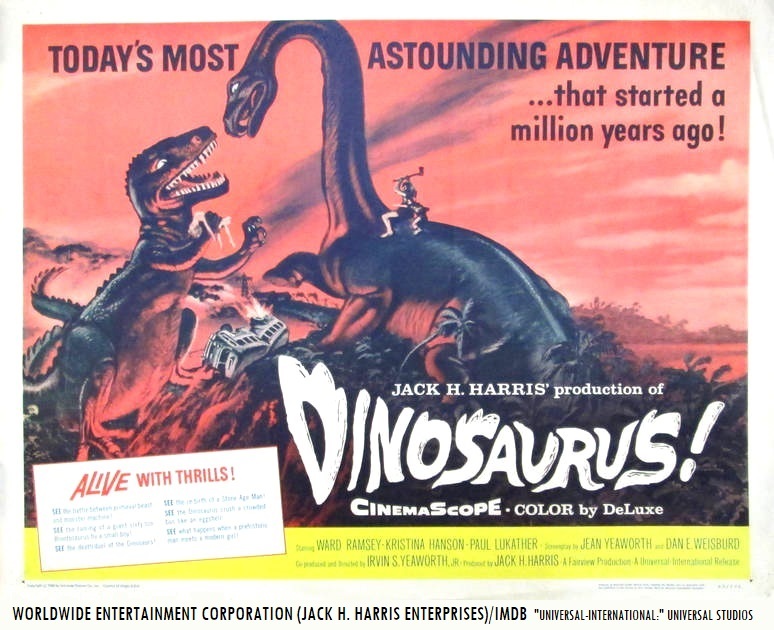 Original Jack H. Harris (Harris Enterprises)/Universal Studios theatrical trailer for “Dinosaurus!” (1960). The beloved Chicago/Berwyn-based horror host will present his premiere of “Dinosaurus!” (1960), this Sat., April 7 at 8 p.m. Eastern/7 p.m. Central on Me-TV. “Dinosaurus!” was directed by Irvin S. Yeaworth Jr. and was produced by Jack H. Harris. Outdoor sequences were filmed on the island of St. Croix, Virgin Islands (according to the American Film Institute’s article on “Dinosaurus!”). The feature was originally released to theaters by Universal Studios in 1960. Two years before “Dinosaurus!,” Harris’ production company and Yeaworth worked on “The Blob” (1958, originally released by Paramount Pictures), which featured Steve McQueen and Aneta Corsaut. The players who appeared in “Dinosaurus!” were Ward Ramsey (as Bart Thompson), Kristina Hanson (as Betty Piper), Paul Lukather (as Chuck), Alan Roberts (as Julio), Fred Engelberg (as Mike Hacker), Lucita Blain (as Chica), Wayne C. Treadway (as Dumpy), Howard Dayton (as Mousey), Jack Younger (as Jasper), James Logan (as T.J. O’Leary), Wilhelm Samuel (as a townsman) and Gregg Martell (as the Neanderthal).